(In)FormResearch Studio’ (MArch, Uni Sydney, 2004). 5 weeks workshop. Throughout the development of architectonics, the production of form has been based on the contemporary understanding of geometry. At the same time, the perception of space as determined by the techniques of visualisation and its mathematics of construction depicted in each epoch’s art/ culture had a strong influence on exactly this geometry – a predetermination of space perception through the training of the eye and shaped the information presented. The cultural shift from the central perspective to photography to film has found its equivalent of form understanding in each epoch’s geometry, integrating time as a relevant additional condition to the original x-y-z axis, thus leaving the metrical space. 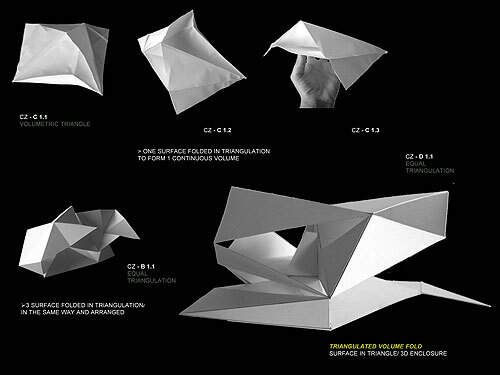 The studio reviews these phenomena of ‘geometry history’ – from Palladian symmetry via the Cartesian grid to the Corbusian Plan Libre – to investigate alternative forms of geometry: With the integration of time as a 4-dimensional factor and the acknowledgement of parallel realities as offered by digital information systems, a series of form generating methods have emerged. The ‘Anamorphical Plan’, ‘Growth and Form’ interdependencies as described by D’Arcy Thompson, the ‘Fluctuating Plan’, grid-independent geometries such as the ‘Moebius Strip’ and the ‘Kleinsche Bottle’, and form-generating processes such as surface bifurcations systems, combined geometry strategies and multiples organization patterns are to name but a few. The 5-week seminar departs from Corbusier’s Domino House that is (re)construct and transformed in a series of models - from the original rules system and designs to diverse passages of unknown forms and formations.